Or maybe it’s just that you really want a certain flower or plant that I simply can’t find here in Pennsylvania. If we work together we can still make some magic! If you have a specific plant in mind, I can send you the materials for you to collect, press, and ship the specimen back to me. Once I receive it, I will finish the drying/pressing process, mount it, and send it back to you completed. The process is simple! 1) When you receive your materials from me you should have (at least) 2 white drying papers and (at least) 2 cardboard ventilators. You should also have an envelope addressed to Ecobota for sending it back. 2) Collect your specimen! It is best to do this in the morning after the dew has dried. You want to make sure the leaves/flowers are NOT WET when they go into the press as this can lead to mold or rot. If you find that the specimen you want is damp, simply leave it alone to dry in the sun. Don’t cut it from the plant before it is dry, as it will wilt and become hard to press while you wait for the water to evaporate. 3) Place one piece of cardboard down on your work surface. Place one of the white drying papers directly on top of it. 4) Place the specimen on the white drying paper. 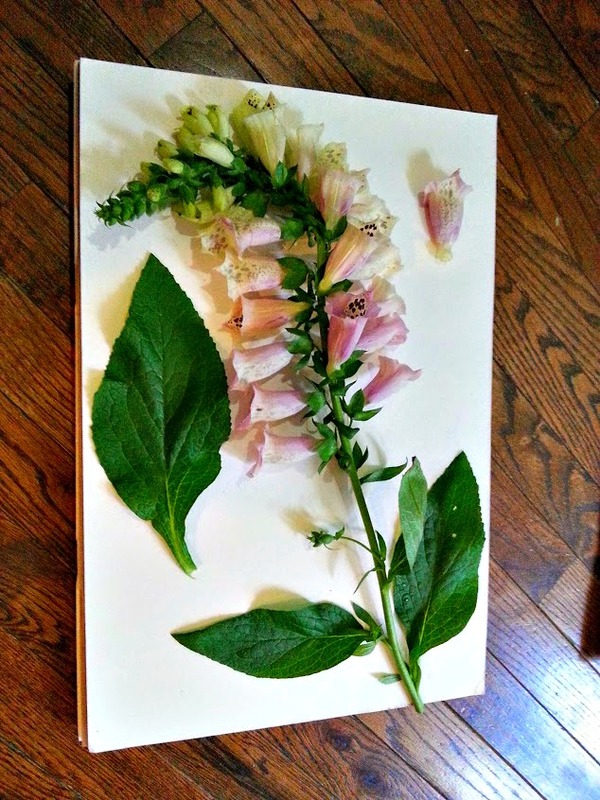 Keep in mind, the way the plant is positioned on the drying paper after pressing is the way it will look as a finished piece, so make sure you can see the parts of the flower, that the leaves are all turned the right way, etc. Also note that the specimen must fit entirely on the white drying paper as that is the size of the finished mounted piece. Any pieces that are hanging off won’t press and won’t fit on the final page. If you look at the picture on the left, the flower stalk was curved to the left to allow it to fit on the drying paper and the large leaf was removed and pressed off to the side because it didn’t fit otherwise. When I mount this piece on the paper, I can reinsert the large leaf in a way that fits the dimensions of the paper. 6) Quickly place the second piece of cardboard down on top. You should have made a sandwich: cardboard, drying paper, specimen, drying paper, cardboard. 7) Add weight! If you are so inspired, step on that stack and use your body weight to really press down the plant material. Otherwise, press down with some force, applying even pressure to all parts of the cardboard. You want to make sure either end is as pressed down as the middle. 8) Add more weight! Go get the heaviest items in your house: Books, a large pot filled with odds and ends, whatever. The ideal thing would provide even pressure: cookie trays are usually the right size. Stack them on the cardboard, or use one with a stack or two of heavy books across the length. 9) Wait 8 hours. Overnight is better. 10) Remove the weights and use rubber bands or twine/string to tightly tie the cardboard sandwich closed. Make sure you tie it off in both directions – you don’t want the specimen to slip out. Plus a tight seal is going to keep pressure on the drying papers while in the mail and the specimen will continue to cure. 11) Place the sandwich in the provided envelope, seal it, and take it to the post office. 2 day priority mail should be sufficient (unless your specimen is very fragile or watery – ask me if you are unsure) and that usually runs between 6 and 7 dollars. Make sure you add your return address, just in case! Thats it! When I get your package I will transfer the specimen to new drying papers, and put it in my press to really finish the job. I will also make any cosmetic touchups I can if the plant is still malleable enough to do so.